Players have been converting online poker chips into solid gold Special Edition poker chips that commemorate Brazilian football hero Neymar Jr’s Olympic gold medal in the Rio games. More than 360 gold chips have been won via limited edition Spin & Go tournaments so far, to the value of more than $290,000. Players who have won a unique piece of PokerStars memorabilia have until February 28 to redeem their gold poker chips. Canadian poker player ‘thx4urm0n3y’ banked $145,747.41 in the PokerStars Sunday Million after beating a field of 5,123 players. The total prize pool was a guarantee–beating $1,024,600. The amount won by one lucky player on PokerStars Casino’s Emperor’s Garden. This Swiss player is planning on spending his winnings on a family holiday. Online satellites to PokerStars Championship Panama continue to run until March 5 on PokerStars including a special $11 satellite running this Sunday giving away five packages worth more than $40,000 in total. Episode number of this week’s Poker in the Ears podcast, which is now available to stream or download. This week James and Joe talk to Twitch’s latest star, Mike ‘Timex’ McDonald. Then Julez Redding from London demonstrates his knowledge of ‘Scott Pilgrim vs the World’ in ‘Superfan vs Stapes’. BetStars Sports Jackpots launched today on all .COM, .EU and .UK markets where BetStars is currently available. 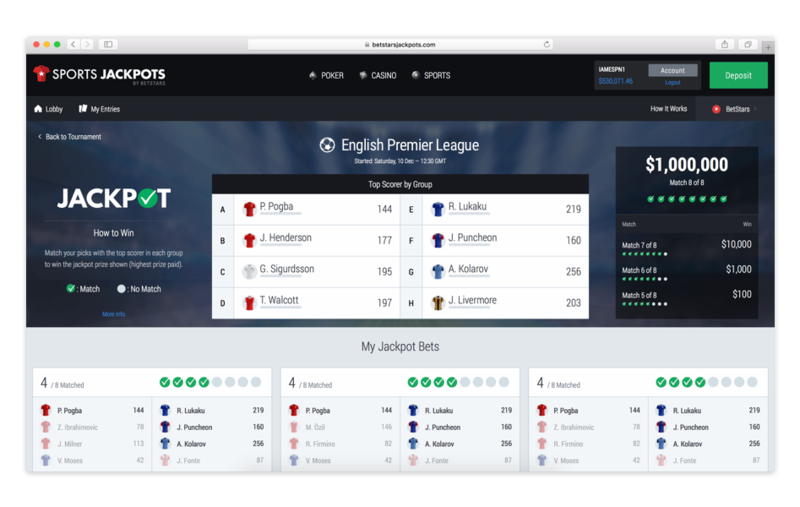 BetStars Sports Jackpots is the newest sports betting innovation from BetStars — a reimagined sports betting experience that combines the best of fantasy football with daily real money tournaments and life-changing $1 million jackpot prizes. Premier League Champions Leicester City have put their skills to the test against the ultimate football machine - a robot constructed by a team of sporting experts – in the latest BetStars Face-Off challenge. BetStars, the Foxes’ Official Betting Partner, put Leicester City heroes Christian Fuchs and Shinji Okazaki up against the robot in a series of events, testing their sporting prowess.